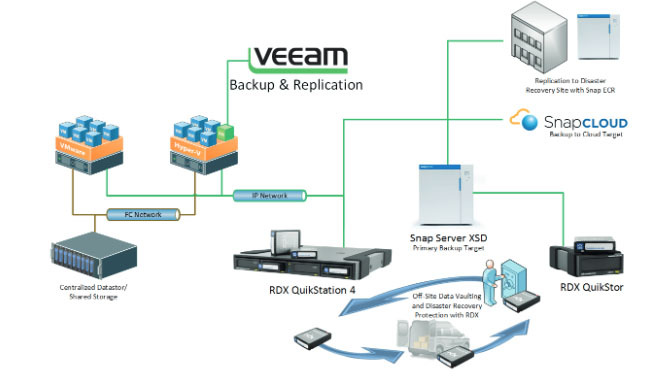 Seamless integration of SnapServer with VEEAM Backup & Replication enables efficient backups with disaster recovery capabilities to RDX removable disk, SnapCLOUD or remote SnapServers. In virtualization-powered data protection, disk storage systems are preferred. Overland Storage‘s SnapServer NAS solutions offer scalable, secure and reliable storage and is the ideal device for central storage and primary backup targets. In addition, a secondary backup target such as tape or removable disk is highly recommended to achieve full disaster protection. Built upon­ the award winning GuardianOS, the SnapServer product family offers enterprise class management and data protection features, from entry level desktop systems to highly scalable rackmount systems for large enterprises. The SnapServer family provides features like DynamicRAID which offers seamless storage expansion by adding or replacing hard drives as capacity needs change. In addition, all SnapServer storage volumes can grow or shrink dynamically within the storage pool without IT intervention, preventing costly provisioning errors and unnecessary upgrades. The Veeam Data Mover service running on SnapServer allows for the processing load to be distributed between the Veeam backup server and SnapServer. This results in faster backup and recovery tasks and simplifies recovery architecture. Veeam Backup & Replication offers fast and reliable backup and restore of VMware vSphere and Mircrosoft HyperV Servers and data. Veeam Backup &­ Replication consolidates backup and replication into one product and sets the new standard for Backup and Recovery by leveraging the benefits of virtualization with Veeam vPower Technology. SnapSever provides data protection features like dynamicRAID or replication capabilities, but a backup copy is still necessary to address accidental or inadvertent deletions and system failures. To be fully protected against site failures, at least one backup copy should be stored offsite as the last line of defense. With SnapServer as the primary backup target, we have a few options for disaster protection. Attaching directly an RDX QuikStor removable disk system to the SnapServer, provides an easy to deploy backup solution that meets offsite compliance requirements. In case of a disaster, VMware and Hyper-V host configurations and data can be easily recovered from an RDX media. For replication to a disaster recovery site, SnapServer offers Snap ECR (Encrypted­ Continuous Replication) at no additional cost. Snap ECR provides a continues data replication to 1 or multiple SnapServers at remote locations. As it replicates changed data only, Snap ECR ensures higher performance and bandwidth savings. For backup to cloud requirements, SnapCLOUD can be incorporated into the backup strategy. SnapCLOUD is a virtual NAS appliance built on Microsoft Azure with enterprise grade data management capabilities. It provides the same interface and features like SnapServer which reduces the learning curve and training cost. SnapServer, SnapCLOUD and RDX can be perfectly merged to create a comprehensive disaster recovery solution based on multiple backup copies and off site vaulting.